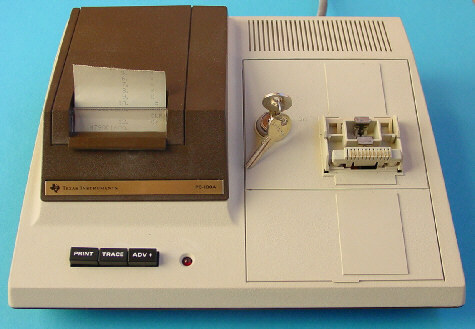 The PC-100A printing cradle followed the PC-100 within a few months. It can be used with the SR-52, SR-56, TI-58 and TI-59 (not the TI-57). Its thermal printer has 64 alphabetic, numeric and special characters which can be printed at the rate of 60 characters per second. Up to 20 characters can be printed per line on 2.5 inch wide thermal paper. The PC-100A can also be used to print, list or trace program steps as an aid to debugging. The PC-100A cradle also had some more features than just the printer. It functions as a power-adapter and also has a storage/charging compartment where you can charge the battery pack. The calculator (and battery pack compartment) is locked solidly to the cradle with the use of a key. Dismantling the PC-100A printing cradle reveals a rather complex printed circuit board (PCB) based on a TMC0251 single-chip micro-computer and two additional TMC0561 and TMC0569 ROM to support the SR-52 respectively SR-56 calculators. Don't miss the SR-60 using similar components. American Micro Products introduced with the Module Selector a very interesting product fitting into the charging bay of the PC-100A printer cradle. Although not officially supported by TI, several people were able to use the PC-100A with SR-51 and SR-51A calculators by putting the PC-100A in SR-52 mode. Some people found that the print mode worked fine with their SR-51's but never could get the trace mode to work, getting a "1" and a "?" on the printout. The SR-51-II cannot be connected to the PC-100A because of a redesign of the battery compartment. Although the SR-50A has a print cradle connector similar to the SR-51, and fits on the printer, apparently it was not preprogrammed for printout. The successor of the PC-100A is the PC-100C which lacks the switch that makes it compatible with the SR-52 and SR-56. The PC-100B was only a short time available, it was a mixture of the old and new cradle. The PC-100A is featured in the Texas Instruments Incorporated bulletins CB-276 and CL-283 dated 1977. © Joerg Woerner, January 3, 2002. No reprints without written permission.